Adam is the offspring of a human and a descendant of Dragons. He grew up in the Zone, a world apart from humanity, as his mother tried to hide him from the father who wants to kill him. It’s there, as a child, he met Ean and they formed a bond even closer than friendship. Ean is completely human but always wanted to be more. As a child, he refused to even acknowledge his humanity, but as he got older, he began to devote himself to belonging to the Dragon-dude that saved him from the streets. About five years ago, Adam’s father found him and killed his mother. Adam has been away from the Zone since then, dedicating himself to making sure his father went to jail. But now, he’s coming home. He’s on the verge of his transition from being just a human into more of a dragon –and it’s terrifying. Upon his return, he reunites with Ean and with Brian, a human with no ties to the dragon world. He wants both men but his tie with Ean is like nothing he has had with anyone else. 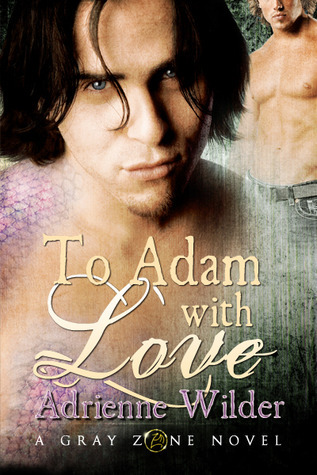 Ean makes it his mission to see Adam through the change and find a way for them to make a life together. I really liked the concept of this book. But it just didn’t work for me when I sat down to read it. The world building is very complicated, necessitating a glossary off the top. But even with the cheat sheet, I had a very hard time keeping some of the terminology straight in my head. All the talk about Males versus Dominants versus Lesser Bred… then who needs who and why and where everyone falls in the hierarchy. Normally, when I find world-building overwhelming, I just try to ignore it and concentrate on the love story, but here, understanding this stuff is vital, since it ties in so directly to the progression of Adam and Ean’s story. Flashbacks from the characters’ childhoods are sprinkled throughout the book and I liked that. I liked the sexual chemistry among the characters, even though I questioned whether perhaps Ean might be a little mentally disabled or just a product of a horrible environment. And I found myself wondering if anyone could find Brian a credible love interest in the face of what Adam and Ean share. Then, when (*spoilers*) poor Brian meets his fate,there is virtually no aftermath. This was a pretty huge development, but everyone is left standing around like it was no big deal. There are clear allusions that the Dragon dudes all sleep together and eat off of each other. Yet Ean is possessive of Adam and jealous. How is this all going to work out? Even with a pseudo-solution at the end, I’m left wondering WTF is going to happen to all these folks now that the book is over?? I feel out-of-sorts and maybe it’s just me. The book seems to have been universally loved by most other people who have read it. It just didn’t work for me. 2 1/2 stars. Aw, sorry you didn’t love this one. I LOVE Wilders Kin world. I guess what is so different about how stuff works out in the end is her characters don’t do HEA they have a happy for this world.